Breast cancer is quite common among American women, so when breast pain occurs, it can be alarming. Let us put you at ease, however, because tenderness or pain in under the right breast is not always a sign of a serious problem. In fact, breast pain is not usually a sign of breast cancer. If you are experiencing pain under your right breast, don’t panic–just come to FastMed. We provide treatment for injuries and illnesses that don’t require a trip to the emergency room. Pain under Your Right Breast? So, what could be causing that pain under the right breast? If the pain under your right breast is affecting your chest more than the breast itself, it could be caused by other conditions, such as indigestion or gall bladder infection. Indigestion can, due to acid refluxes, cause a burning sensation in the right side of your chest. Gallbladder infections are caused by an inflammation of the gallbladder and typically cause a sharp pain the stomach or right side of the chest. If you are experiencing pain under your right breast, it is important to seek medical attention as soon as possible and determine the cause. Early diagnosis of pain under your right breast can prevent the development of more serious complications. 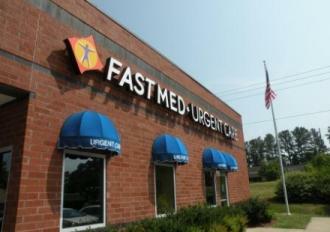 FastMed walk-in clinics are open with extended hours 365 days a year. We are a fast, affordable, and reliable alternative to the emergency room when non-life-threatening illnesses or injuries strike.